Based on the influx of refugee children from neighbouring countries, the Kingdom of Jordan has been facing overcrowding at schools. Jordan’s Government introduced the double-shift system in 1960 as an approach to solve this issue. The system has helped to provide more vulnerable and refugee children with education. Nowadays there are 100 public schools in Jordan that operate the double-shift system. To help us further understand the current situation, let’s have a closer look at Jordan’s location and history: The small country is located in the Middle East. Jordan’s recent history has been shaped by conflicts in the region and in bordering countries and the resultant influx of refugees, which causes constant pressure on the country’s political, economic, social, and educational infrastructure. 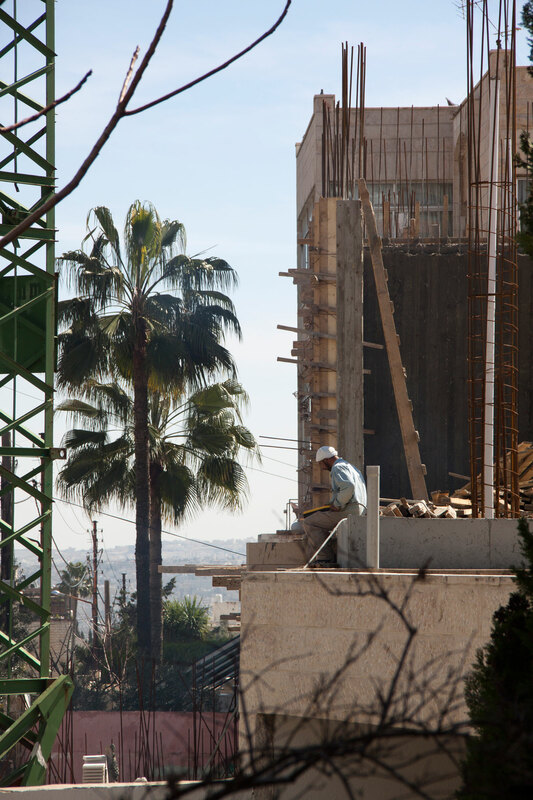 Unsurprisingly, construction in Jordan’s capital city of Amman is booming. Being historically built on seven hills Amman now extends to over 25 hills and is still growing. 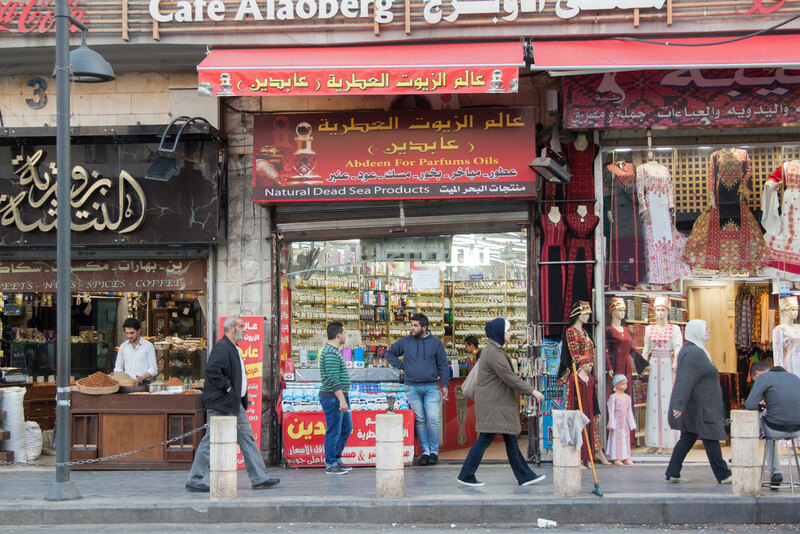 Amman’s population increased more than fourfold in the last 12 years but experienced the biggest population growth in the last five years after the Syria crisis began. 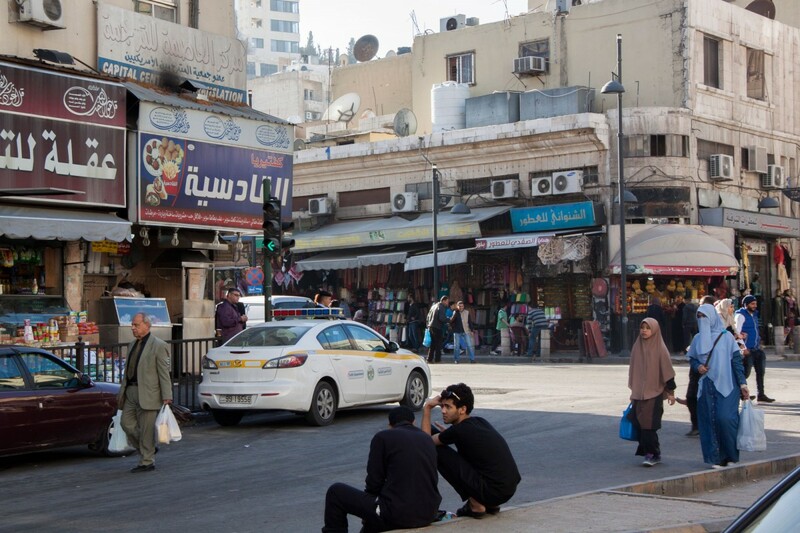 The cityscape of Amman is very homogeneous – encouraged by regulation of the Jordanian Government – the vast majority of buildings are constructed out of white limestone. 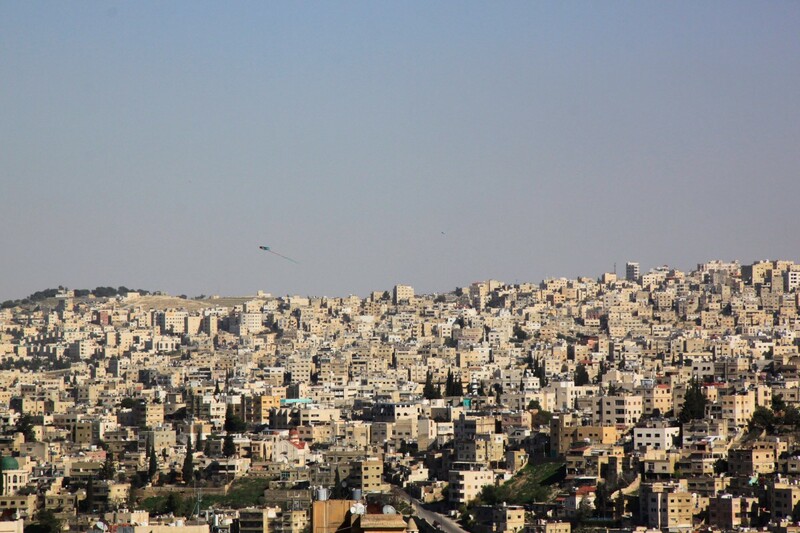 Construction in Jordan’s capital city of Amman is booming. Last year around 2000 houses were built. The straight, flat thoroughfare leading through the historical downtown area is lined by a diverse array of businesses and continual hustle and bustle. The five daily prayers are announced by the Muezzin – his summoning call can be heard throughout the whole city. During dusk the atmosphere is special. Amman is home to many cultures – as a result there are a great number of culinary delicacies from across the Levant. 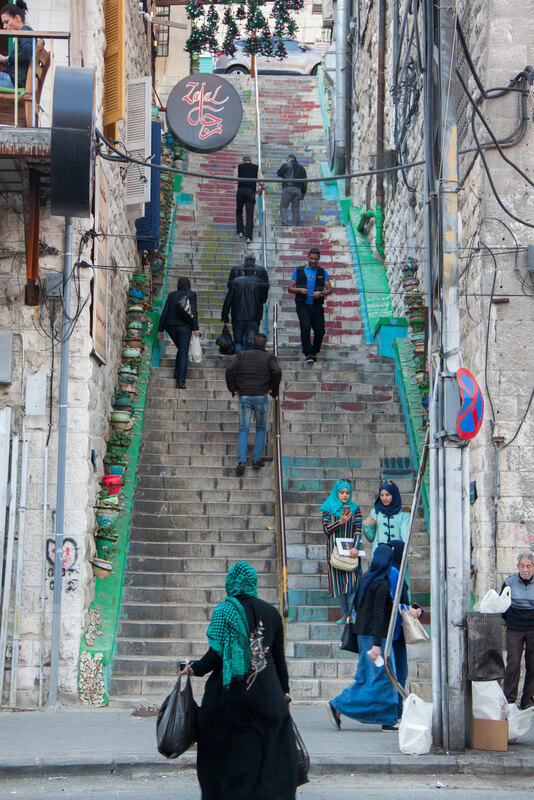 Amman’s public transport network is under developed. 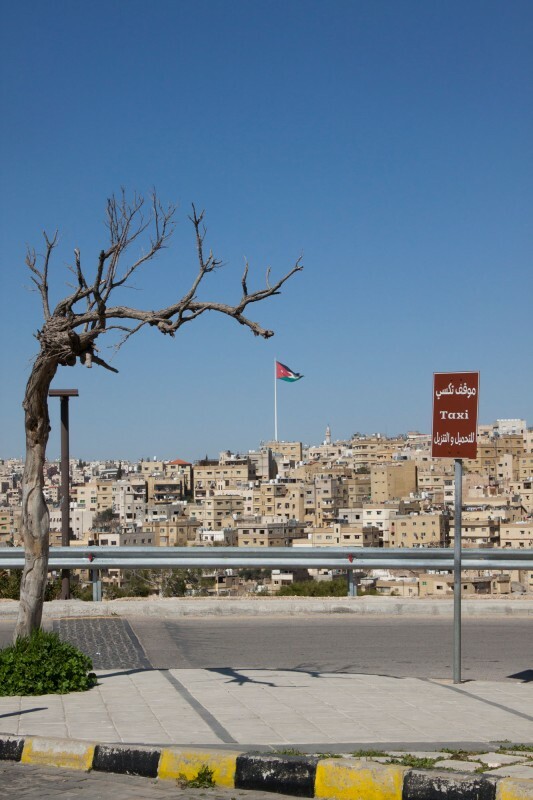 It mainly consists of mini buses, which often arrive late or not at all – giving rise to the expression “inshallah – so god will.” That is why there are many taxis and cars in Amman. Amman is home to the 127 meter high Raghadan Flagpole – at its construction in 2003 it was the largest freestanding flagpole in the world. Above the city, flocks of pigeons fly around until dusk. 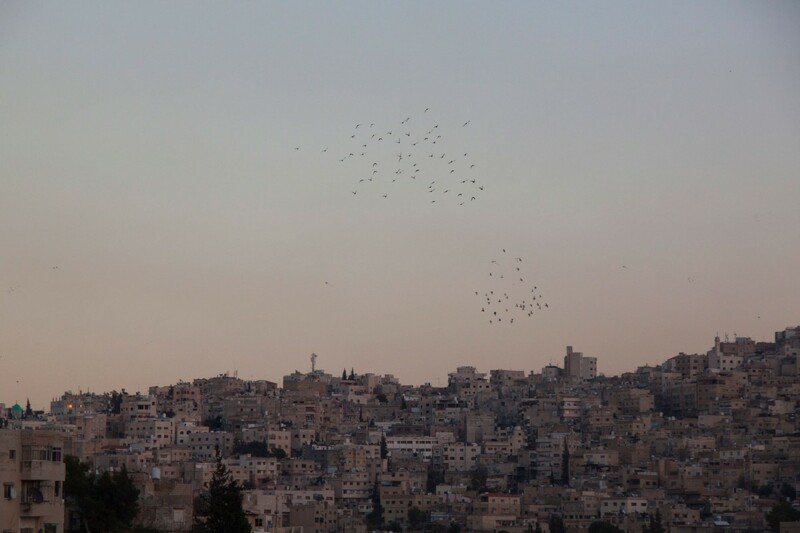 They shape the image of Amman. Most of them are homing pigeons and are released for training. The aim is not to race them but simply to acquire more, by fair means or foul. It’s a hobby – a sport activity. 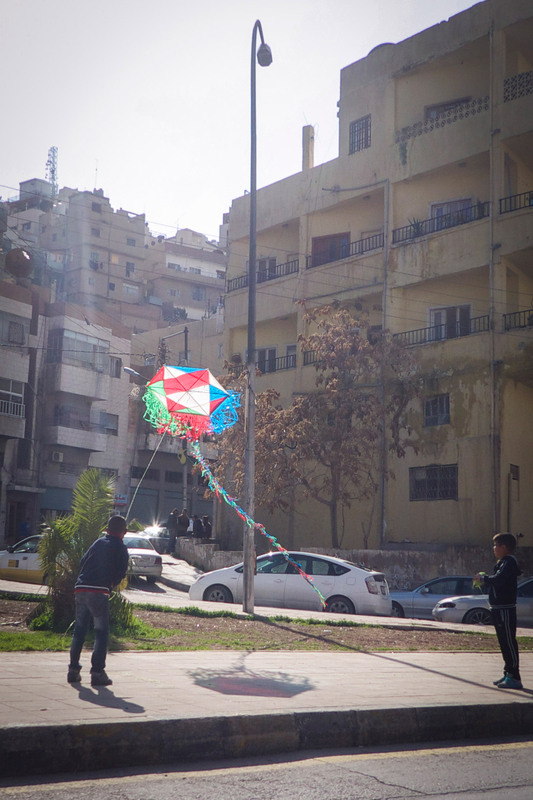 If the weather cooperates you can see children playing with their hexagon kites on street corners. In Jordan the normal workweek is also 5 days, however the weekend is on Friday and Saturday. The minimum wage in Jordan is JOD 220 ($310). The annual per capita income is not much higher at around JOD 307 ($433) per month. 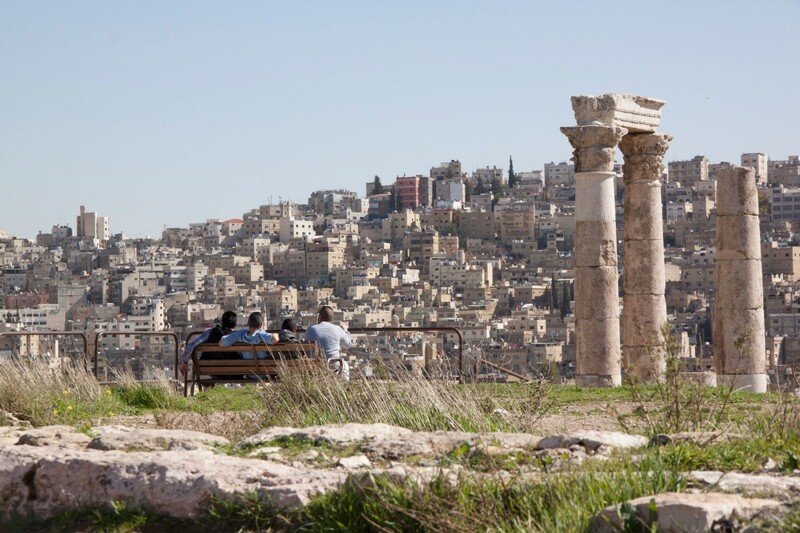 Amman is one of the oldest cities in the Middle East. Today it’s a buzzing hub of many cultures and identities. 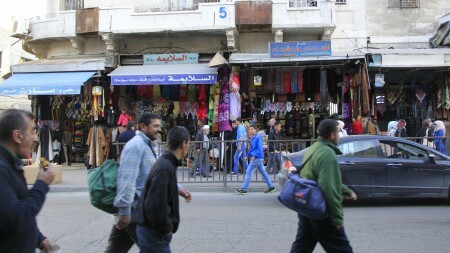 Currently every tenth inhabitant of Jordan’s capital Amman is a Syrian refugee. Not only Greater Amman, the capital of Jordan, accommodates Syrian refugees but the whole northern region including Irbid, Mafraq, and Zarqa. 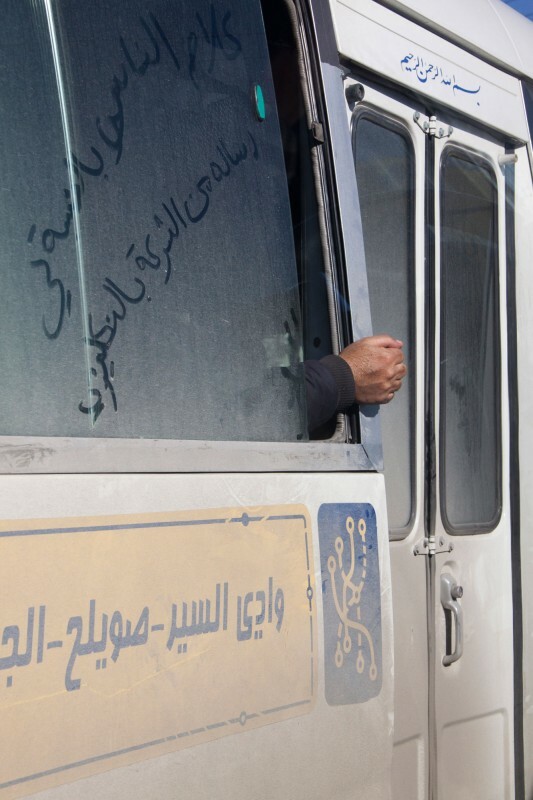 In total, Jordan has taken in 1.3 million Syrians of which only 650,000 are registered as refugees by UNHCR. Approximately 80 percent of refugees2UNHCR are integrated in cities and villages, living in so-called host communities. Most of them are in the industrial areas in the north, as these are the places where it is possible to find work. This leads to an agglomeration of Syrians in specific places. The remaining 20 percent of registered refugees have found shelter in refugee camps such as the well-known Zaatari camp. Integrating all refugees into the Jordanian society is a very difficult task, but the Jordanian people are committed to making it a reality. 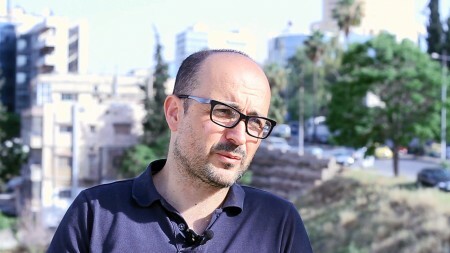 Steffen Huck, Head of the Economics of Change department at Social Science Center Berlin (WZB), describes his personal impression. Click to read. 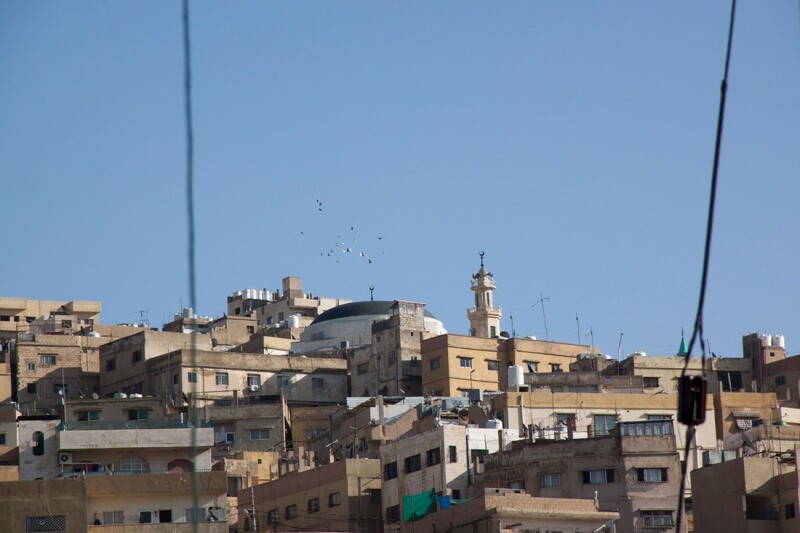 Since its foundation in 1946, Jordan has been a resource poor country. It does not have indigenous oil sources – in contrast to almost all other Arab countries – and is one of the most arid countries in the world. 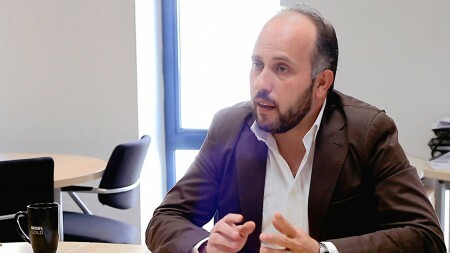 Its infrastructure struggles to cope with the population increases in the last decades and the political instability in surrounding countries is considered to be an obstacle to growth of trade and tourism. Despite these challenges, which were there already before the Syrian conflict, Jordan invests great efforts to host and integrate as many Syrian refugees into the society as possible. This affects a great number of areas. A closer look at the public sector reveals overcrowding and lack of resources as the main challenges to integration. Public schools are now accommodating even more students, putting a greater strain on teachers and materials. Despite facing these obstacles, Jordan continues to reach out to all out-of-school children and does its best to provide access to formal education.